Samantha enjoyed participating in a wonderful pageant organization called America's National Teenager Scholarship Organization. She was thrilled to win the State level competition and behold the title of Miss California Junior National Teenager 2004/2005. Being a state delegate allowed her the privilege of spending a week in Nashville with her sister queens! It was one of the most meaningful and eventful weeks she had ever lived. It was there that she was inspired to start her own charitable project through the example of the girls she met. The pageant organizers had every day booked with charitable projects, community events, fun trips for the girls, practice for the final show. The girls were so nice to each other and she made friends easily with exceptional girls from all over the country. As she was only 15, she was in the junior division. 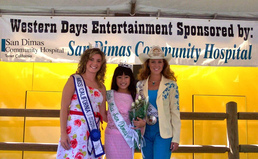 Nicole Johnson, the Miss California National Teenager was an absolute sweetheart to her lil' sister queen Samantha. More to follow about Samantha's pageant experiences and the inspirational people she met while there. 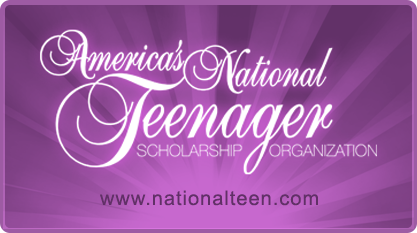 Read our blog for more or visit the America's National Teenager Scholarship website!